January 19 and 20 – Kim? Contemporary Art Centre invited to participate in two evenings dedicated to the figure of the truth teller. 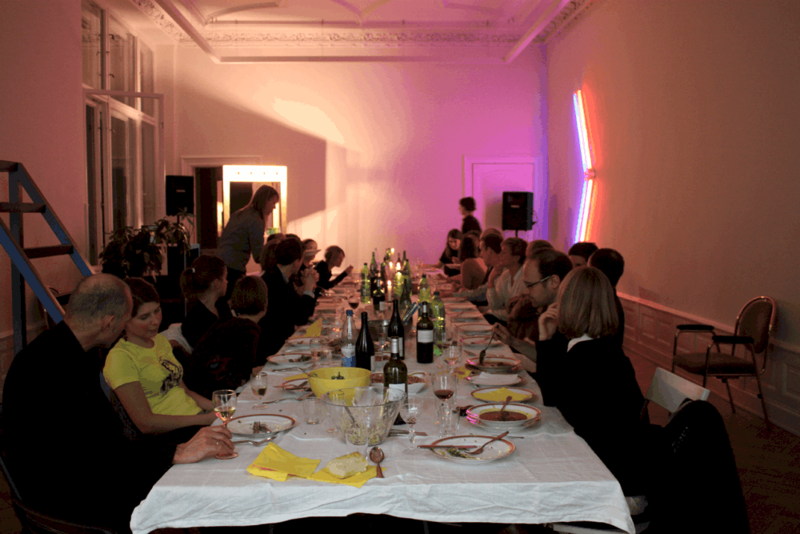 Adapting the ancient Greek tradition of coming together to eat and drink while at the same time discussing philosophical questions, we would like to introduce the format of the Potlach to conduct joint dinner-conversations at Kim? and other locations in the city. In cooperation with independent curator Ellen Blumenstein (Salon Populaire, Berlin) and the Art Academy of Latvia, we chose “the truth teller” as the first subject to discuss our own relation to truth. Starting from both philosophical texts and personal experiences, stories and thoughts, we have invited art historians, writers, critics, and artists to contribute to the diversity of the two events. January 19, 4:20 pm – Talk at the bookstand with Ellen Blumenstein and professors of art at the Art Academy of Latvia, Kalpaka boulevard 13. For the first afternoon at the Art Academy of Latvia, wanted to take advantage of the intense atmosphere created by the internal public between students, professors and associated individuals inside the art school research context. We intended to – by bringing attention and the very presence of professors, artists-students, budding art theoreticians of Academy to raise the questions, share concerns and develop possible future strategies based on the experience or a pure vision-based-observations about issues as honest (true?) as arts and education, arts and location (Academy as a frame to shape your future), arts and communication. The event was designed to warm up the audience and its relations to the thematic resulting in a subsequent desire to want some more. January 20, 7 pm, Kim? library – Potlach or dinner-conversation with Ellen Blumenstein and Kim? team. On the next day we continued the discussions at Kim?, starting from contributions of the institution’s team members, who each took the truth teller as a starting point to prospect one’s positioning inside of and towards the arts’ centre itself, but also for its role as a vital part of the cultural context within the city of Riga. Further from this context guests reflected on their perception of Kim? through the lense of the evening’s topic, and expand the notion towards the necessity of having a truth teller in a society at large. Each guest was invited to bring food and drinks to contribute to the physical well-being of the participants, and a contribution of their choice, which they relate to the truth teller. Ellen Blumenstein (1976) is an independent curator from Germany and a member of the curatorial collective The Office (founded in 2009) as well as a representative of Salon Populaire – a meeting point for conversations on art and neighboring topics, for the convergence of different ideas, positions and contexts. From 1998 – 2005 Ellen Blumenstein worked as a curator for KW – Institute for Contemporary Art. Since then she has curated a number of exhibitions in Germany and elsewhere in Europe. Support: State Culture Capital Foundation, Goethe-Institut Riga, Eurolines Lux Express.